What is the believers’ most important testimony? 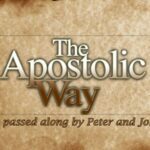 This sermon is part of a series named THE APOSTOLIC WAY. There are 84 other sermons in this series. Did you know you can subscribe to our Sermons using iTunes on your PC, Mac, iPhone, iPad, or iPod Touch!? Simply go to the iTunes Store and search the Podcasts for Sonlife Community Church.